The Belmont wetlands run along the coast between Lake Macquarie and Nine Mile Beach. Despite being one of our most beautiful and precious ecosystems, the area is a hot spot for illegal dumping. The Belmont Sustainable Neighbourhood Group wanted to clean up the wetlands and deter further dumping. 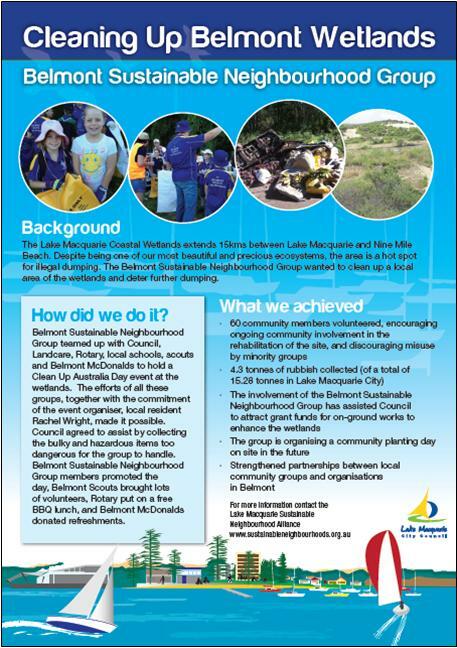 Belmont Sustainable Neighbourhood Group teamed up with Council, Landcare, Rotary, local schools, scouts and Belmont McDonalds to hold a Clean Up Australia Day event at the wetlands. The efforts of all these groups, together with the commitment of the event organiser, local resident Rachel Wright, made it possible. Council agreed to assist by collecting the bulky and hazardous items too dangerous for the group to handle. Belmont Sustainable Neighbourhood Group members promoted the day, Belmont Scouts brought lots of volunteers, Rotary put on a free BBQ lunch, and Belmont McDonalds donated refreshments. Check out some of our other projects.